We have an exciting announcement from Thalapathy 63 team. Yes, art director Muthuraj just gave us a breaking news that the set work for the film has begun today in Chennai. He has also shared a photo which suggests us that the set is being erected at Binny Mills. Atlee will be joining hands Vijay for the third time after Theri and Mersal. Kalpathi S Agoram, Kalpathi S Suresh & Kalpathi S Ganesh's AGS Entertainment who has been waiting to work with Vijay for a long time will be funding this big-budget action entertainer. Thalapathy 63 has a strong technical team that comprises of AR Rahman for music, Ruben for editing, GK Vishnu for cinematography and Muthuraj for art direction. 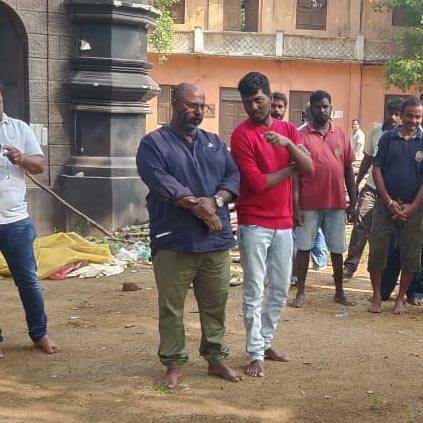 Muthuraj took to his twitter space to announce about the set work - "The setwork begins today... #Thalapathy63 #atlee #Thalapathy #ARRahman #AGSEntertainment #gkvishnu"
People looking for online information on Thalapathy 63, Vijay will find this news story useful.